Greenville, SC - On Thursday, September 7, The Wilmington Boat Show kicks off the second annual show with a special VIP Preview and Party Under the Stars at the Port City Marina. This event gives boating enthusiasts the opportunity to walk along the docks of the marina and view some of the boats before the show opens the next day, Friday, September 8. VIP’s will enjoy hors d’oeuvres and two drink tickets, with a cash bar following. Also included in the ticket price is one complimentary ticket to the boat show, live music and great fun. On September 1, the $50 ticket price will go up to $60. There are a limited number of VIP tickets available. The party will be held at VIDA at the Port City Marina and catered by Blackfinn Ameripub. It is sponsored by Epic Finance and Marathon Specialty Finance. “Last year, at the inaugural Wilmington Boat Show, we hosted an invitation-only VIP party. It was a great event, but this year we want to give the public an opportunity to celebrate with us,” said show founder and President of JBM & Associates, Jacqui Bomar. 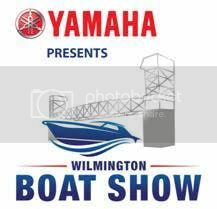 The Wilmington Boat Show, Presented by Yamaha Motor Corporation, launched last September with an attendance of more than 12,000 people. This year’s show features more than 150 vendors, 85 boat lines, hundreds of boats on sale and everything nautical. The show will be held at the Wilmington Convention Center, Port City Marina, The Shell and Battleship NC. Wilmington Water Tours will ferry people between locations, compliments of the boat show. The Wilmington Boat Show is Presented by Yamaha Motor Corporation and sponsored by RAM Truck/Neuwirth Motors, Gulfstream Yachts, Allstate Boat Insurance, Maritime Insurance International and ILM. The VIP Party is sponsored by Epic Finance and Marathon Specialty Finance. Water ferries are sponsored by Wilmington Water Tours. The Show will open at Noon on Friday, September 8, and close at 6pm; Saturday, September 9, from 10am-6pm and Sunday, September 10, from 10am-5pm. For information and to purchase tickets please visit www.WilmingtonBoatShow.com . Contact Erica Allen for exhibit space information. [email protected] 864-250-9713. Wilmington Boat Show tickets are discounted if purchased online. You may also show your Battleship NC tickets for $2 off boat show admissions at the box office. Download the FREE JBM Shows mobile app for all the details.